In this session, learn how students use the iPad to document the learning process and create a window into the classroom. The camera and video are powerful tools in the science lab. Pre-K Guidelines - Child describes life cycles of organisms. The child plants seeds, then observes, discusses, and records plant growth. Students should know why they are using the iPad for learning. A simple task card can help keep them focused. Pre-K and Kinder- Printing an app card that displays what the students will be using will set the expectation for your early learners. You can download the examples we used for stations below. 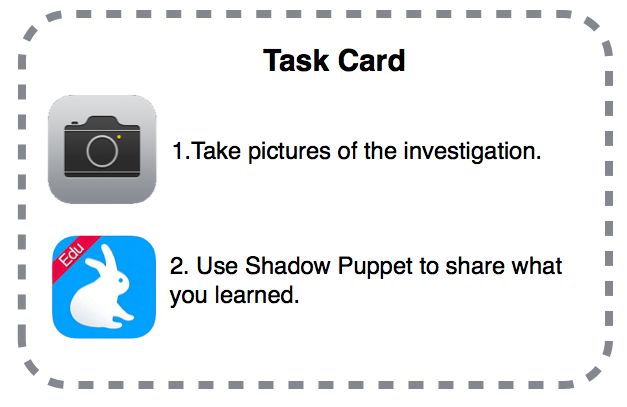 1st and 2nd Grade- Printing a task card with expectations will point students in the right direction. You can download the example we used for stations below. Students should always know why they are using the iPad for learning. A simple task card can help keep them focused.